Free course, room, and lodging! Note: Please put the date and time of your arrival and departure in the Order Notes when checking out. Learn about the Vedic Mother Divine festival. Vedic Temple ceremonies honor a different aspect of Mother Divine each day, inviting you to connect more deeply to those qualities within yourself. Please put your arrival and departure dates in the Order Notes when checking out. The Seva Mother Divine Retreat starts at 7:00 am with meditation on Sunday, September 29 and ends after dinner clean-up on Tuesday, October 8. You have the option of staying longer to do additional Seva and help out. Please let us know your availability. Be sure to read the Before You Come to Retreat. 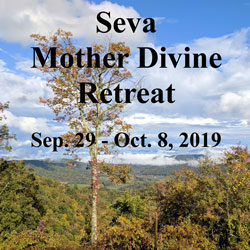 This Seva Mother Divine Retreat is designed for people who like to help out, and who want to save money by volunteering. Seva (service) participants help out morning, afternoon, and evening with a large portion of cooking, cleaning and dishes. Generally, these participants do fewer rounds a day than the rest of the group, with a minimum of 3 rounds per day. Seva participants will be able to attend any retreat lectures unless they interfere with meal preparation. Seva participants will also be able to attend all Mother Divine Pujas and Havans. If staying in the Student Union, Seva participants are required to stay in Basic (shared room) Lodging. In order to qualify for this Seva Retreat, applicants must have previously attended at least 1 full-priced, week-long, Surya Ram Meditation Retreat or 1 year Surya Ram Classes. Application required before Saturday, September 15. The meditation schedule will accommodate all Pujas and Havans. Below is an abbreviated list of ceremonies during the retreat. Go to the Sri Somesvara site for more information and to contribute to ceremonies.